All transactions are safe and secure with a reliable history in online purchasing behind each of our associates. 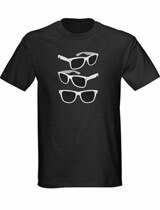 Buy the Jonas Brothers Wayfarers tee to own Jonas Brothers clothing and merchandise. Feel like a true rock star in this Jonas sunglasses tee. The familiar looking Ray-Ban Wayfarer sunglasses are one of the group's trademark accessories. Wear it with a real pair of Ray Ban sunglasses for the perfect Jonas Brothers costume. Pair it with a Jonas hoodie sweatshirt for the perfect gift. Like the comfortable zip-up jacket, the hoodie will keep you warm on chilly days when your Disney Jonas Brothers jacket is too much and the tees aren't enough. Wear the hoodie over the other great merchandise displayed in the gallery or with a matching hat. In addition to the Jonas Brothers Wayfarers tee above, browse the Jonas Brothers Clothing Gallery for more apparel like men's and women's clothes, kids shirts or hoodies.